The hatchback from Maruti Udyog Ltd. has been a big hit in India. The car has been rated as one of the best selling city cars in the country. 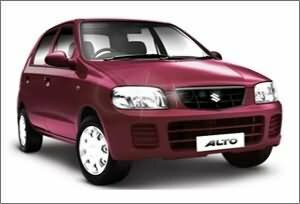 Maruti Alto is available in various sizzling colours like Caribbean Blue, Superior White, Pearl Silver, Bright Red, Wine Red, Brilliant Yellow, Midnight Black and Silky Metallic Silver. The stylish front bumper and attractive front grille gives an elegant look to the car. The bold headlamp cluster, front fog lamps and tail lamps provide an extra ordinary look to the car. The dynamic front grille with Suzuki logo and sleek bumper gives an impressive front view to the car. Maruti Alto offers great comfort and pleasure to the occupants. The ORVM, the power windows in both, front and rear seats, tinted glasses provide the much needed comfort. The integrated front seats available in the car offer comfort and support during long drives. The car has cup holders, front door pockets, glove box and huge boot space. On the whole the car is ultra spacious. The car can easily accommodate a family of four persons. Other comfort features include Remote Back Door Opener, fuel tank lid opener, Key-Off Remider. Maruti Alto has the provision for speakers with surround sound effects that make the journey enjoyable. The car is fitted with air conditioner and heater. The vents are located at the dashboard. Maruti Alto has taken care of the safety aspect of the passengers. The safety features include front and rear seat belts, head restraints, the integrated Intelligent Computerized Anti Theft System (iCATS). The vehicle is equipped with collapsible steering column and side impact beams which act as shock absorbers. The booster assisted brakes present in Maruti Alto provide a safe journey. The tubeless tyres and unique high mount stop lamp are other safety features. The front suspension is of McPherson strut with torsion type roll control device and rear suspension of coil spring gas filled shock absorbers with three link rigid axle and isolated trailing arms. This new frame type front suspension arms provide better stability and driving comfort. Maruti Alto is powered by 796 cc MPFI engine which produces a maximum power of 47 bhp at 6200 rpm and a maximum torque of 62 Nm at 3000 rpm. The engine has 3 cylinders and four valves per cylinder with 32 bit ECM. Low engine friction makes the car fuel-efficient. However, the prices specified above are indicative prices only and exclude tax, registration, insurance and cost of accessories.